Reserve Your Dates and Times Online! 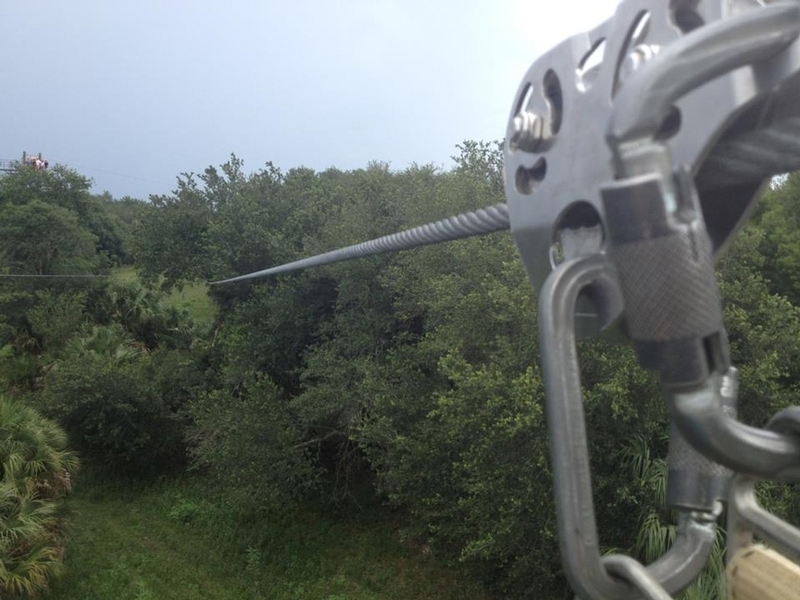 The Intro Zip Tour consists of Zip #1 and #2 with the Indiana Jones suspension bridge. 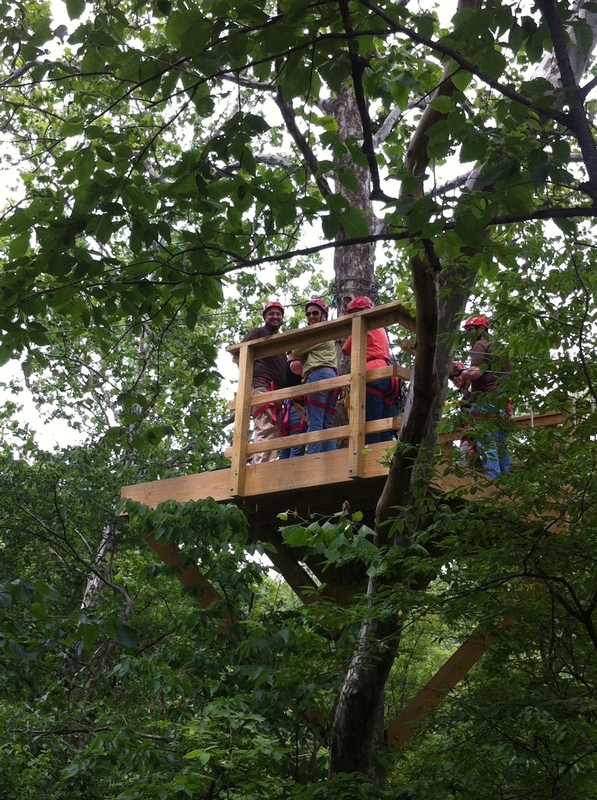 This is the perfect tour for those afraid of heights, or needing an orientation experience before taking on the longer faster zip lines. It is also a great tour for booking of Birthday Parties, Special Events, or other guests who have limited time frames or larger group numbers. 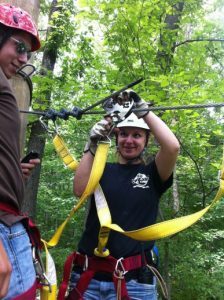 This tour includes only Zips 1 & 2 (150 foot to 300 feet long) and the 75 foot long Indiana Jones style suspension bridge (easy/moderate difficulty). Tour may last up to 1.5 hours with larger group sizes with experienced guests and smaller tours requiring less time. Reservations strongly recommended, with walk-in guests welcome to jump in any open slots, first come first served. Height minimum is 42" with a weight range of 60 - 275 pounds. No group discounts apply for this tour. 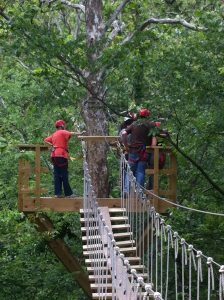 Consists of 6 challenges; 5 zip lines from 150 foot to 1,000 feet long, a 75 foot long Indiana Jones style suspension bridge (easy/moderate difficulty). Tour takes roughly 2.5 hours for a group of 12, slightly faster for smaller groups. No age limits! Must weigh between 75-275 pounds and be at least 48" tall. Minors must be supervised at all times. Come join us for our night tours! Tours have an opportunity to watch participate while night falls across Alpine Hills. Every guide is equipped with a low-light lantern and every guest is provided their own personal glow stick. As you zip through the trees an eerie glow will heighten the senses and send chills over your body! Trust us, it's a rush! Our Night Tour Halloween style, the Zip Zombie Terror Tour lets you howl at the harvest moon as you zip among the terrors of the dark. Dare to cross the suspension bridge over spooky ghouls waiting for you below. 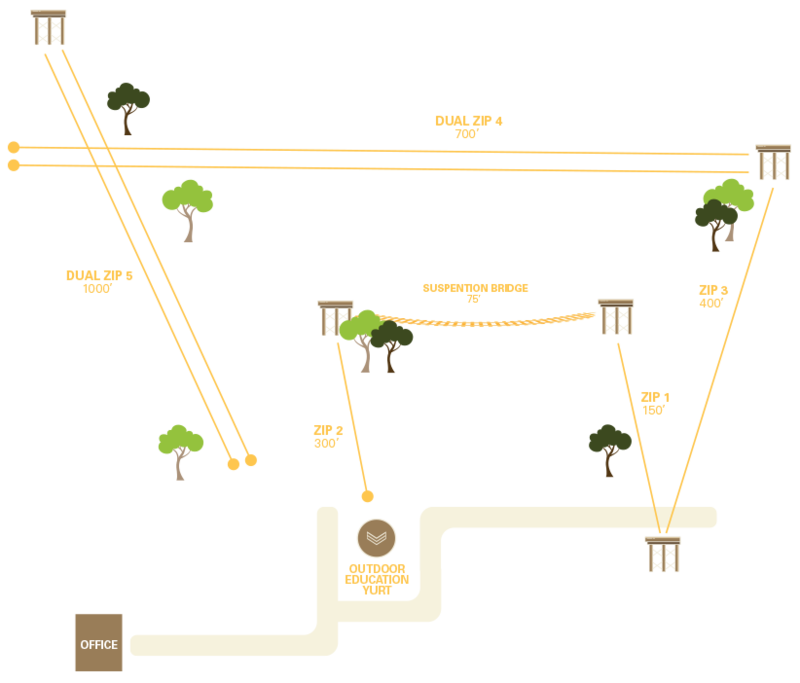 Make your narrow escape from creepy zombies as you climb the tower before descending the Quick Jump. It's spookier in the dark! 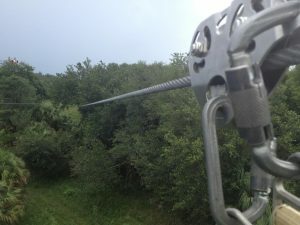 This fully guided tour begins by zipping off a haunted 20 foot tower and arriving at another 45-foot tower within a matter of seconds! 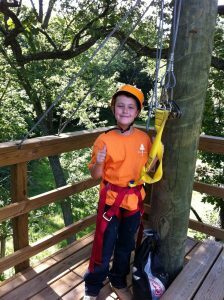 The tour consists of 5 zip lines ranging from 200 to our patented double wide 1,000 feet long and our Indiana Jones suspension bridge. The haunted platforms provide stellar views of the city lights. This tour includes ALL Zips 1,2,3,4,5, and the Indiana Jones style suspension bridge. Tour may last up to 2.5 hours with larger group sizes with experienced guests and smaller tours requiring less time. WARNING - Strobe lights and other special effects may cause seizures. All tours are designed to operate best with guests weighing between 75-275 pounds with a 48” height minimum. Operation outside of this range is not recommended. Guests who are pregnant, have back injuries, or other medical conditions that may limit their participation are recommended to seek written medical clearance prior to participation. 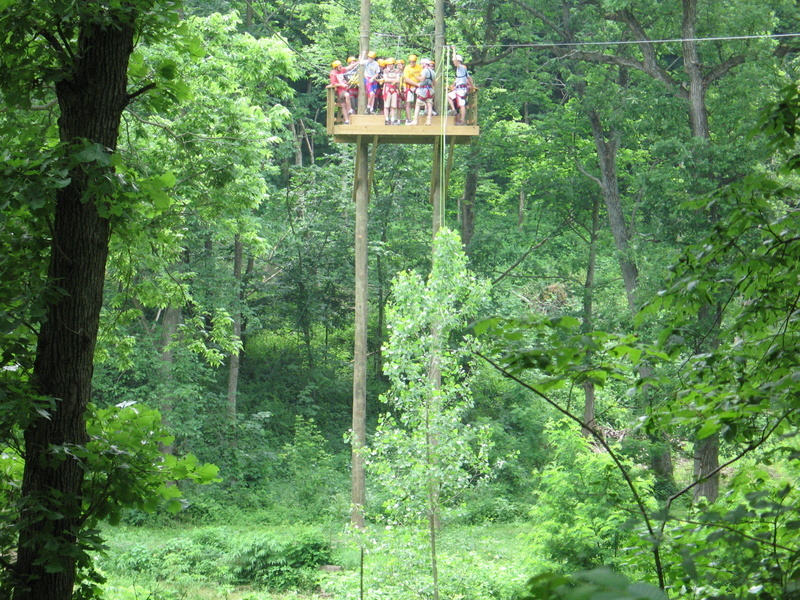 Tour requires moderate physical exertion for walking, hiking uneven surfaces, stair climbing, and standing / balancing on a swinging suspension bridge. A signed waiver is required to participate. Tours operate rain or shine, warm or cold (other weather permitting). A forecast is only a prediction of weather in a general area. 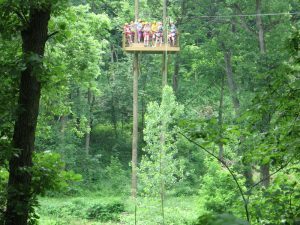 Tours will be canceled at Zip Rockford's discretion if the weather conditions at the scheduled tour time +30 minutes make it unsafe to zip. If at the tour time the weather is unsafe in Zip Rockford's opinion, the tour will wait for up to 30 minutes for the weather to clear. 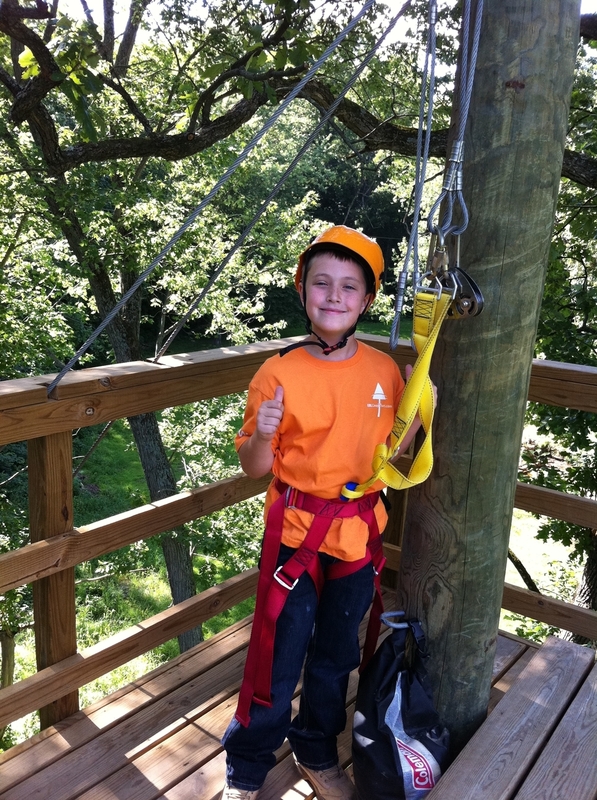 If after 30 minutes from the scheduled tour time the weather is deemed unsafe by Zip Rockford, refunds or reschedule will be offered per the guests preference. Refunds as a result of cancelation will result in a full refund of the paid ticket price only (including any taxes and processing fees.) Guests who no show or depart before the +30 minute wait period expires, forfeit their refunds or reschedule ability. Online reservations may be made up to 24 hours in advance of a specific tour time and walk-ins are accepted. Cancelation Policy: 72 hour minimum notice policy for refunds or reschedules. 10 days minimum notice for refunds or reschedule on large groups. Business Groups; please call our office to secure a custom tour date and time. Published open dates on our calendar are reserved for individuals and families. Other terms and conditions may apply. ZR reserves the right to refuse service to anyone with or without reason, with or without refund. Groups of 8 or more are eligible for a 10% discount, via a single paying source for full amount of booking. Please contact our office for assistance in making group reservations. Brought to you by EBL Zipline Tours. The nation's premier zipline installer. © 2019 Zip Rockford. All rights reserved.